The notion that certain mental or physical events can capture attention has been one of the most enduring topics in the study of attention owing to the importance of understanding how goal-directed and stimulus-driven processes interact in perception and cognition. Despite the clear theoretical and applied importance of attentional capture, a broad survey of this field suggests that the term "capture" means different things to different people. In some cases, it refers to covert shifts of spatial attention, in others involuntary saccades, and in still others general disruption of processing by irrelevant stimuli. The properties that elicit "capture" can also range from abruptly onset or moving lights, to discontinuities in textures, to unexpected tones, to emotionally valenced words or pictures, to directional signs and symbols. 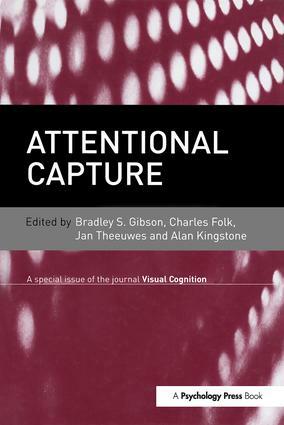 Attentional capture has been explored in both the spatial and temporal domains as well as the visual and auditory modalities. There are also a number of different theoretical perspectives on the mechanisms underlying "capture" (both functional and neurophysiological) and the level of cognitive control over capture. This special issue provides a sampling of the diversity of approaches, domains, and theoretical perspectives that currently exist in the study of attentional capture. Together, these contributions should help evaluate the degree to which attentional capture represents a unitary construct that reflects fundamental theoretical principles and mechanisms of the mind. Gibson, Folk, Theeuwes, Kingstone, Introduction. V. Santangelo, C. Spence, Crossmodal Attentional Capture in an Unspeeded Simultaneity Judgment Task. E. F. Ester, E. Awh, The Processing Locus of Interference from Salient Singleton Distractors. B. S. Gibson, T. A. Bryant, The Identity Intrusion Effect: Attentional Capture or Perceptual Load? S. Forster, N. Lavie, Attentional Capture by Entirely Irrelevant Distractors. C. L. Folk, R. W. Remington, Bottom-up Priming of Top-down Attentional Control Settings. J. Theeuwes, E. Van der Burg, The role of cueing in attentional capture. J. D. Eastwood, A. Frischen, M. Reynolds, C. Gerritsen, M. Dubins, D. Smilek, Do emotionally expressive faces automatically capture attention? Evidence from global-local interference. S. B. Most, J. A. Jungé, Don’t look back: Retroactive, dynamic costs and benefits of emotional capture. R. Godijn, A. F. Kramer, Oculomotor Capture by Surprising Onsets. G. Horstmann, S. I. Becker, Effects of Stimulus Onset Asynchrony and Display Duration on Implicit and Explicit Measures of Attentional Capture by a Surprising Singleton. C. Owens, B. Spehar, Unique temporal change does not account for attentional capture by sudden-onsets. V. M. West, J. B. Hopfinger, Memory’s grip on attention: The influence of item memory on the allocation of attention. E. Birmingham, W. F. Bischof, A. Kingstone, Gaze selection in complex social scenes. H. Karacan, M. M. Hayhoe, Is Attention Drawn to Changes in Familiar Scenes? J. R. Brockmole, J. M. Henderson, Prioritizing New Objects for Eye Fixation in Real-World Scenes: Effects of Object-Scene Consistency. G. Kuhn, B. W. Tatler, J. M. Findlay, G. G. Cole, Misdirection in magic: Implications for the relationship between eye gaze and attention. Bradley S. Gibson is Associate Professor in the Department of Psychology at the University of Notre Dame, France. Charles Folk is at the Villanova University. Jan Theeuwes is at the Vrije Universiteit, Amsterdam, the Netherlands. Alan Kingstone is at the University of British Columbia, USA.